How is Monero compared to Dash? There are 2 main privacy-centric Bitcoin-like payment blockchain and cryptocurrencies – Dash and Monero and are always being compared to one another. The social contracts of the two coins have diverged substantially over the past several years. Monero has consistently put privacy and security over usability and marketing. Most early users were relatively tech savvy as the official wallet required the use of the command line. Although GUI development began in 2014 it ceased completely for a long time following the August 2014 spam attack with cryptographic research focusing on privacy and security being given the highest priority. Monero today is completely different than it was in 2014 with the inclusion of LMDB, RingCT completion, funded Kovri development underway and much more. Although the GUI was released in December 2016 and has improved usability, the Monero community is much more excited about the mandatory enforcement of RingCT (was activated in January 2017) and multisig. The goal of the Dash Evolution project is to make cryptocurrency as easy to use as PayPal and similar services, but without the centralization and fees. So it’s kind of like the 2012 version of Bitcoin where you know, we maybe have like 60 merchants accepting it, that sort of thing. Except instead of how using Bitcoin still feels like using PGP, how it still felt like using PGP a year later in 2013, in a year from now Dash will feel like using PayPal. And you’ll get to, you’ll get to be your own bank. Dash uses a modified version of coinjoin to enable its users to mix their outputs with each other. Coinjoin was originally proposed by Gregory Maxwell, and has been available for use in Bitcoin for some time. There are a number of services which connect Bitcoin users looking to mix their outputs, the most popular of these being JoinMarket. Dash's privacy feature, called PrivateSend, is a series of chained coinjoins. To use PrivateSend, you must first allow the Dash client to "mix" your coins. Once this feature is enabled by a user, the client will start looking for other users with whom to mix. Depending on the number of "rounds" selected, this process can take anywhere from half an hour to several hours. Each round refers to an individual coinjoin with at least 2 other users. These individual coinjoins are then chained, which simply means that multiple coinjoins are performed one after another, ideally with different users participating in each coinjoin. According to the Dash developers, a higher number of PrivateSend rounds increases the privacy of a user's transactions. PrivateSend does have a potentially serious flaw. Each coinjoin requires a server to facilitate the mixing. This requires users to trust that the server is not recording details on where each user's outputs are ending up. Dash attempts to mitigate this risk by using what they call "masternodes". Masternodes are the servers which coordinate PrivateSend. These masternodes require a deposit of 1000 Dash to run. In theory, this collateral prevents someone from creating an arbitrary number of nodes for the purpose of recording coinjoin details. Does this really mitigate the risk of coinjoin details being recorded, enabling transactions to be traced? Not reliably. The reality is that the majority of masternodes are hosted by a small number of VPS providers. These VPS providers could easily record the transactions being facilitated by any masternode that they host. Monero uses a cryptographic primitive called ring signatures. As implemented in Monero, a ring signature joins a user's transaction with other transactions, such that an observer can not tell which transaction in the ring is the "real" one. These other transactions do not need to occur simultaneously with the one that a user wishes to create. Monero can use any transaction in the blockchain as a participant in a new ring, assuming the correct outputs are present. This is superior to coinjoin for a number of reasons. First, there is no need to trust a mixing server. Valid transactions are created by a user's client and then submitted to the network. Second, the privacy afforded by Monero is ensured through cryptography. Ring signatures have gone through decades of peer review in academic journals. This is time tested cryptography, which means a significantly higher degree of reliability. Finally, Monero is one of very few cryptocurrencies which have actual cryptographers working on them. If you visit the Monero Research Labs page on Monero's website, you can view some of the research that has been published. These cryptographers are actively working on identifying and correcting any flaws in Monero. Monero cryptocurrency is based on the CryptoNote protocol, where Dash (also known as Darkcoin/XCoin) is based on other proof-of-work. They both were introduced in 2014 and both they have innovative features such as obfuscating the flow of funds in opposite to Bitcoin where all transactions are publicly available. The great thing about Monero is that no-one really is in charge, so it has a bigger community and possible better technology. It's worth to mention that Darkcoin had controversial lunch on 18th January 2014, where 1.9 million coins were mined in first 48 hours (32% of the supply as of October 2015), 1.5 million in the first 8 hours. According to Duffield, this was the result of an error, and after generating controversy regarding the initial distribution of coins, the difficulty has increased by 100x lowering the block emissions, total coin supply (80mln to 20mln) without mentioning that on the website, therefore they had to rebrand it twice to avoid further controversy. This situation discouraged a lot of people from using it. Despite some early issues, the privacy feature seems to have attracted support from the Bitcoin community. Secondly Dash may be more dangerous, because of masternodes which can be easily DDOSed (by broadcasting masternodes's IPs), this means using a lot of masternodes and massive computing power can execute a DDOS on the masternodes they don't own, so it's inherently flawed. Monero on the other hand repelled the biggest attack in cryptocurrencyreddit. From the technical perspective Monero focuses more on privacy and may have more robust privacy features. It enjoys a fair distribution and has the support for both large investors and technical people. By securing the whole workflow by I2P, it ensures a high standard of privacy as secure it may be. On the other hand Duffield designed recently Dash Evolution which is claimed of a new type of cryptographic currency with various advanced features which is basically a new type of API where the process is completely decentralized and still highly secure. This makes both cryptocurrencies equally good, sufficient, possess significant algorithmic differences and in general doing a good service to the cryptocurrency space. Honestly, which is better? Monero or Dash? Not the answer you're looking for? Browse other questions tagged cryptocurrency-comparison dashpay or ask your own question. Why was I2P chosen over Tor for native Monero integration? 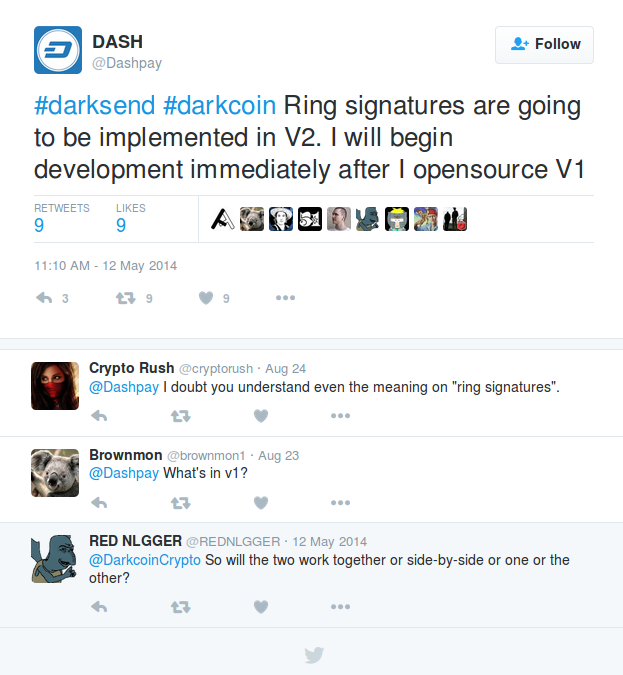 Is Dash based on CryptoNote or CoinJoin? Why did Monero choose LMDB over alternative database types? Vcash privacy and scaling compared with Monero? What are the primary differences between Monero and Bitcoin? Does Bitcoin have any technical advantages over Monero? How does ShadowCash compare to Monero? What will Enable monero to scale where Bitcoin failed? How does TumbleBit privacy and security compare with Monero? Does Monero (XMR) or Pirate (ARRR) offer better privacy and security?